April 27th, 2001 - Companion Air Incorporated in California (where else). September 12th, 2001 – Version 1.0 of companionair.com is launched. February 1st, 2002 – Companion Air adds first 2 full time employees. March 12, 2002 – Companion Air registered as a Service Mark with the U.S. Patent and Trademark Office. August 14, 2002 – LOI to become FAA certified Air Carrier filed. September 4, 2002 – Companion Air President, Rick Roof, appears on MSNBC’s Jerry Nachman Show live and the press frenzy takes off. November 8, 2002 – Companion Air Ware product line goes on sale. December 31, 2002 – Initial Seed round for funding development activities closed. April 11, 2003 – 5000th newsletter subscriber registers. April 17th, 2003 – Companion Air received FAA Air Carrier Certificate recognizing them as an approved commercial operator. May 7th, 2003 – NBC Today Show Travel Editor Peter Greenberg calls Companion Air a "Great Concept". July 28th, 2003 – Inaugural Companion Air Shuttle flight operates from Chicago to Hollywood, Florida. Novemeber 30th, 2003 – The Fine Living Network airs the Story of Companion Air on their program "Radical Sabbatical". December 28th, 2003 – CNN talks to Companion Air on their weekend program "In The Money". In 2000, Companion Air’s Founders, Rick and Diana Roof, along with their partner Murphy were traveling across the U.S. almost constantly, As they spoke to people they met along the way, Rick and Diana began to realize the difficulties most animals had in finding safe, comfortable travel. While Murphy never flew in cargo, many of his fellow travelers did. Commercial Airlines only offered cargo service to those Companions too large to travel in-cabin and even the smaller animals had to work hard to secure a spot under a seat. Busses and trains didn’t transport pets and driving was often the only option for safe, comfortable travel. While driving could be a wonderful family experience, it often limited how far and when pet lover families could travel. As Diana and Rick began to research more and talk to pet lovers across America, it became clear that new travel alternatives were drastically needed. But how? Short of creating a new Airline, how could travel for the animal members of our families be improved? Months of research, modeling, expert consultation and testing led to the Companion Air concept. 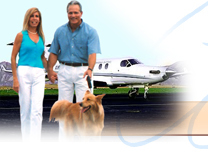 The objective was to provide travel nationwide, in a safe and comfortable environment. Companion Air would need to ensure safe ground handling and offer their services at a modest (although not bargain) price. Clearly a wholly new concept was needed and so the Companion Air service was designed using small, new generation aircraft, operating into secondary airports, adjusting to travelers demands using “Flex-Scheduling”, with a limited number of pets on each flight. The vision - safe, comfortable travel for pets and their families across the U.S. and Canada was doable. From that modest beginning, the groundswell began. Early in the planning stage, the word leaked out about a new travel service and pet lovers everywhere reacted. People wanted to know more so a web site was created and Murphy’s newsletter was launched. The press “discovered” Companion Air and articles, TV spots, and radio interviews began to spread the exciting news. All the while, the Companion Air team continued to work though the massive steps necessary to launch a new kind of airline. In the face of one of the most difficult periods in American aviation and during an economic downturn, Companion Air continued to move toward “first flight”. For those who learned of Companion Air in its early days, their period of development often seemed to last a lifetime. For those who have been part of the Companion Air effort, the dream of a better way for animals to travel has fueled their efforts and kept them climbing the mountain. The support of the thousands who sent notes of encouragement, spread the word about Companion Air, purchased & worn Air Ware, and signed up for newsletters kept the Companion Air team moving forward in the face of many difficulties. So a major change in pet travel is underway. The Companion Air Story has just begun. While the effort is great, the need is critical and on the day when the plane with the big blue paw rolls up to the terminal in your home town, you will know that the dream has taken wings…and those animal members of our families, can finally travel with us as they deserve, in safety and comfort and love… and all of the waiting and work will have been worth it.